Does My Valrico Dentist Care About My Diet? When people in the Valrico area think of diet and oral health, they probably think about the damage sweet drinks can cause to teeth. While it’s true that these sugars cause increased acidity in the mouth and lead to tooth decay, soda and sugary-fruit drinks are only part of the issue. The typical American diet tends to be high in calories and low in nutrition, even here in the Valrico area. If your body is lacking in certain nutrients, the tissues in the mouth may have trouble resisting infection. These infections can lead to gum disease. 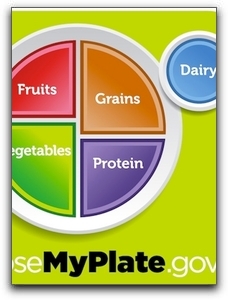 The U.S. Department of Agriculture has recently unveiled the MyPlate graphic to illustrate a healthy diet. Half of our meals should be composed of fruits and vegetables and the rest should be equally divided between lean protein, whole grains, and low-fat dairy. While this is an excellent resource, dietary needs change throughout life, so it’s a good idea to call Five Star Dental Care at 813-653-2273 and schedule a check-up with Dr. Jeff Bynum to see if your diet is affecting your teeth. When you eat a balanced diet and feel your best, you’ll want to look your best, so be sure to ask our knowledgeable staff about the latest cosmetic dentistry procedures such as complete smile makeovers and same day restorations. At Five Star Dental Care, our menu of services includes crowns, veneers, inlays, onlays, dental implants, tooth colored fillings, sealants, teeth whitening, and clear braces. For nervous dental patients, we also offer sedation dentistry, so you can get the comprehensive care you need while staying calm and relaxed during your visit. This entry was posted on Friday, October 26th, 2012 at 11:18 am	and is filed under Education, General Dentistry. You can follow any responses to this entry through the RSS 2.0 feed. Both comments and pings are currently closed.